So in addition to those "fluidic" nozzles, I ordered something else from the US at the same time (not wanting to pay more in postage than in parts!). 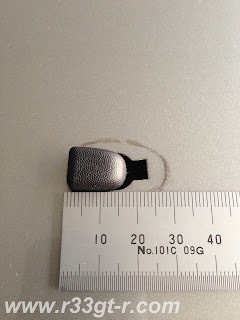 SERIOUS PERSONAL INJURY OF PROPERTY DAMAGE????? Then again, it could be the contents. Those scissors in the wrong hands, that might be deadly. Indispensable? A touch of luxury? 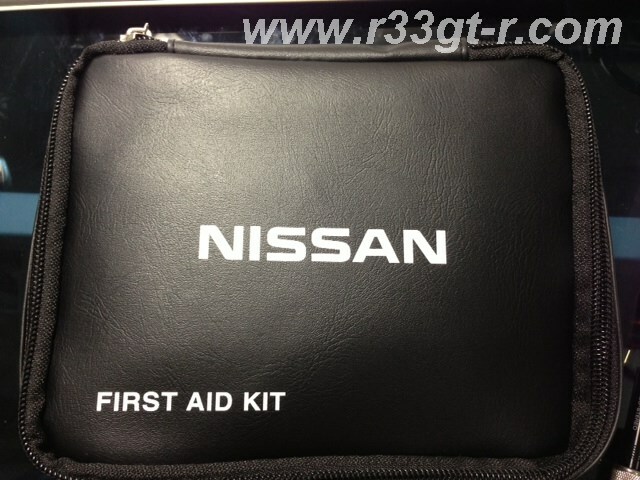 The R33 GT-R didn't come with this, of course. But luxury cars (like Mercedes) do. So why not my car? 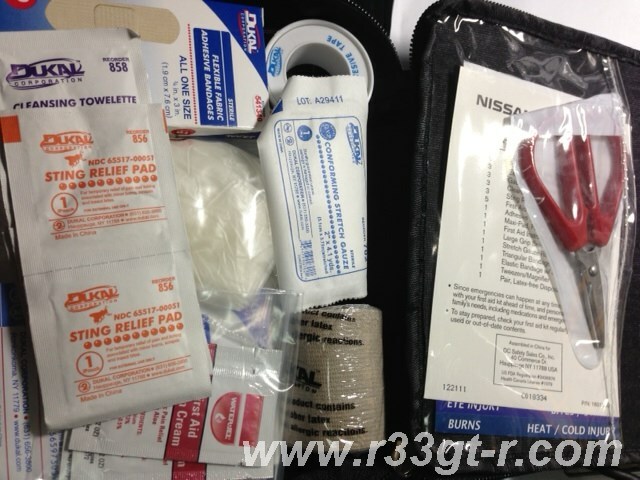 But then realized that it would be a good idea to have the kit accessible when something happens IN the car, rather than having to stop the car to apply a bandage. 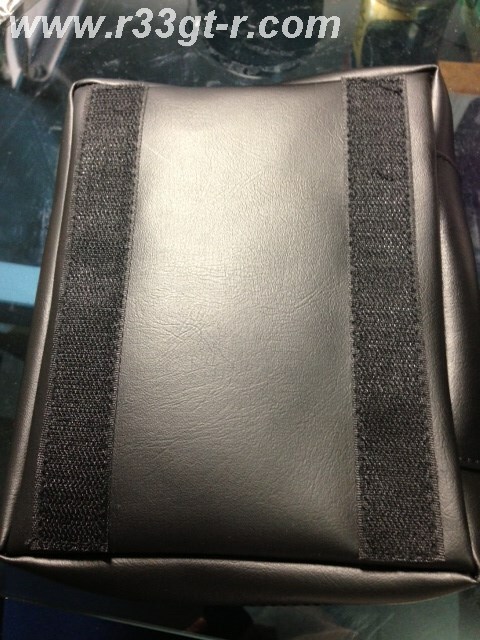 Plus, the shape of the back board there, AND the material, was not as "Velcro(R) friendly" as it could have been. 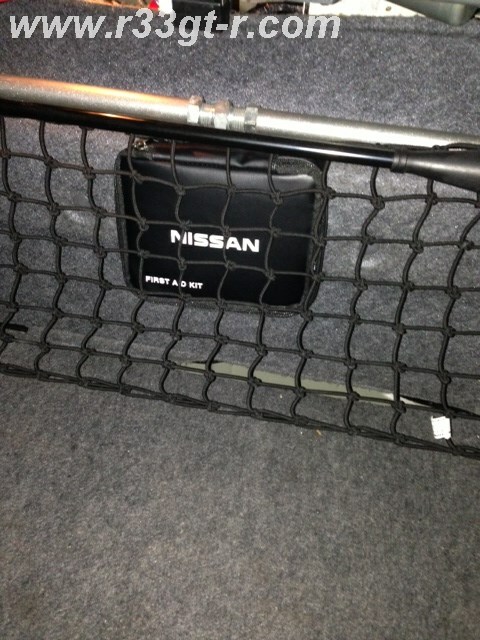 So I ended up mounting it on the "carpet" between the two speakers on the rear parcel shelf, where it fits perfectly (although it would be cool to have this section indented and/or covered like the German cars...). Oh well. 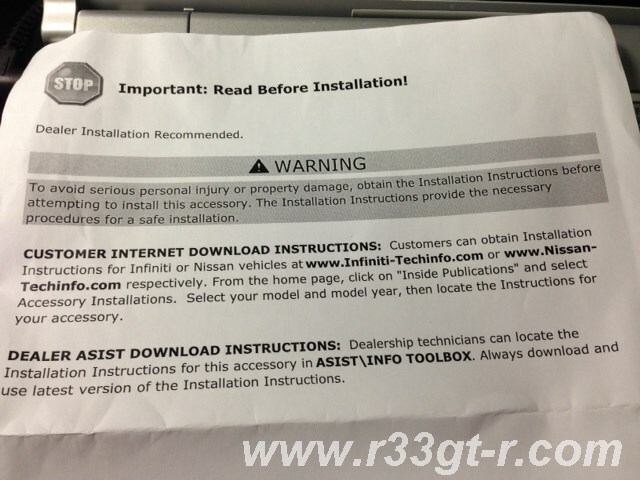 Better than nothing, but I wonder if installation here might lead to "serious personal injury or property damage"?? Unlikely, I think as this "carpet" DOES NOT LET GO of VELCRO!! Anyway, a somewhat of a flippant post - actually there were NO installation instructions included - but I wonder - who of you out there have such a kit in their car? Any ideas and comments on where to mount it? I think in some countries, an onboard first aid kit is required, no? 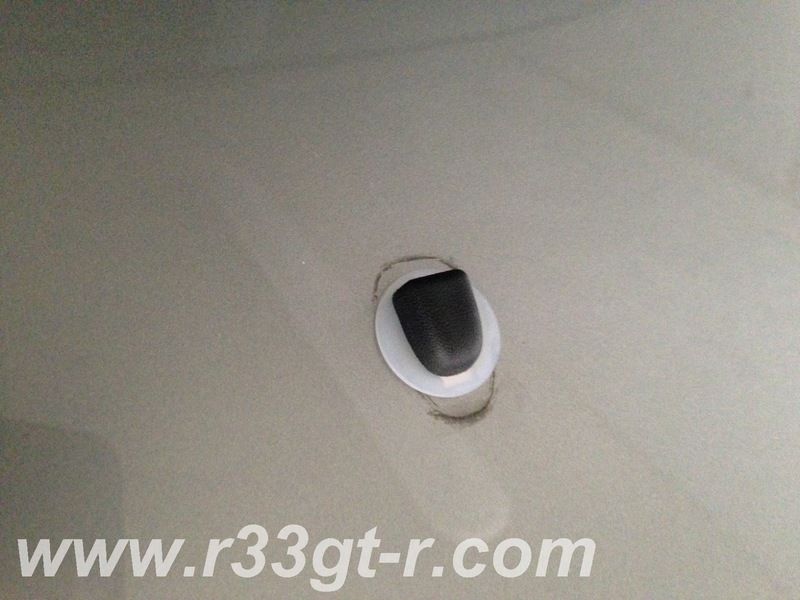 So, given our discussion on aerodynamics, I asked Andrew Brilliant, my neighbor and world reknown aerodynamicist, what’s good and bad on the R33 GT-R? 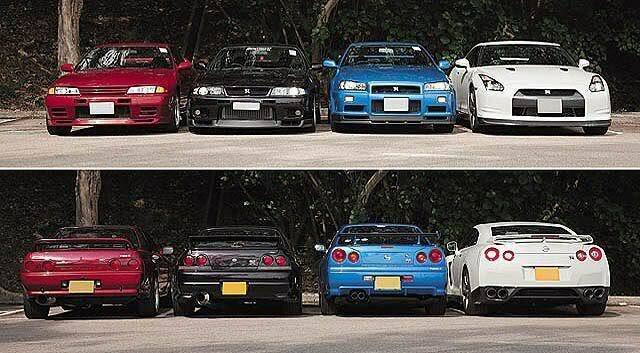 What’s good is that Nissan and other Japanese manufacturers in the 90s actually exerted effort in putting their cars through aerodynamic development, trying to reduce drag and increase downforce. 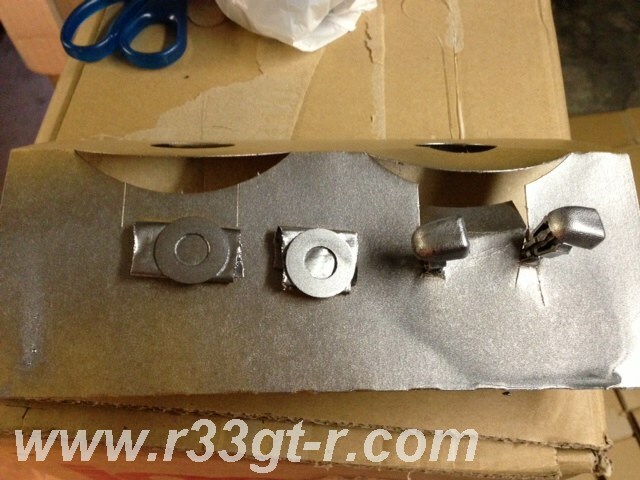 Wind tunnel testing during R33 development. From "All About the New Skyline GT-R" published on February 18, 1995 by Motorfan when the R33 GT-R was released . 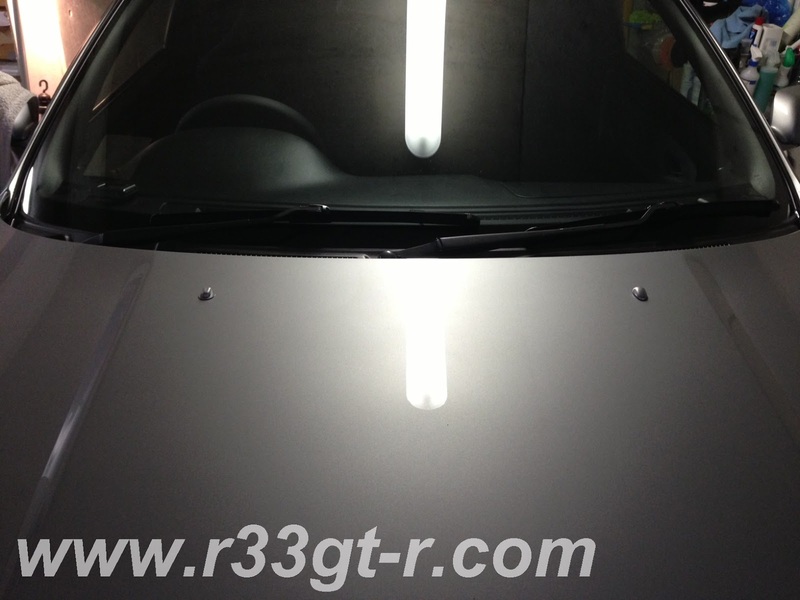 As a result, the 33’s rear spoiler produces more downforce at the full down setting than the R35! 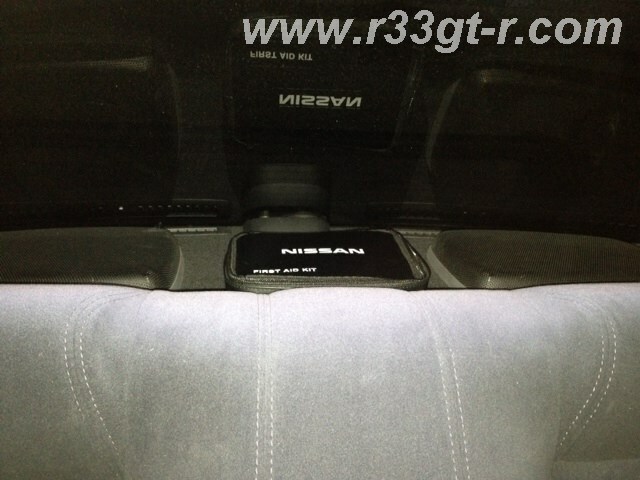 However, the R35 is NZL (near zero lift), while the R33 has positive lift on the front. Andrew believes this is most likely (and is expected in a road car) due to all the openings for cooling air, which have not been properly managed, as well as the leveraging effect from the rear wing. Like its RB26 brothers, the R33 also has lots of intakes for the engine intercooler and radiator, as well as various other openings. 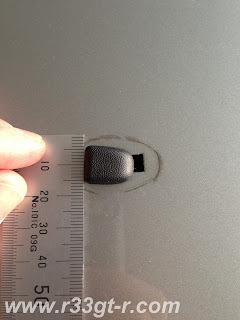 What this does, of course, is to increase the amount of air under the hood, but if the car doesn’t have a vented bonnet, then the only path for the air to flow out, would be under the car. What about my car? There are various bits that I have added without really knowing what I was doing, and of course I have some future plans as well. 1. 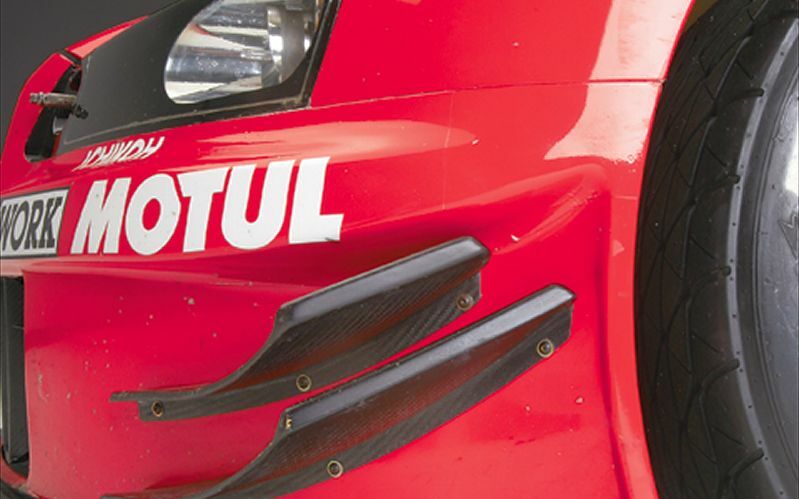 For example, the aforementioned R34 rear diffuser appears to be a good idea – with a slight weight penalty, but it would clean up the rear of the car, reducing drag, maybe some additional downforce. 2. 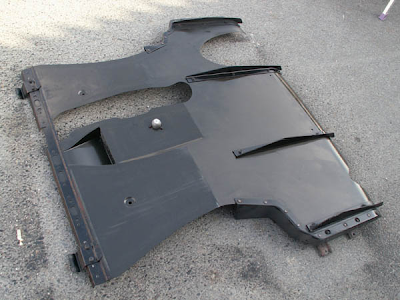 Yahoo Auctions sourced rear carbon wing blade. I’ve always been curious about this, because looks-wise it’s the same as the OEM wing, but it has this small upwards flap (aka Gurney flap) at the rear edge. Good news, Andrew believes that this probably IS effective, and in fact, may even reduce drag a bit! 4. Side skirt and Side vents. Unfortunately for one of my planned projects, the conclusion here was to cap off the functional scoops on the Nismo side skirts. To the extent that the Nismo side skirts extend to the ground lower than the stock ones, there is some effect. 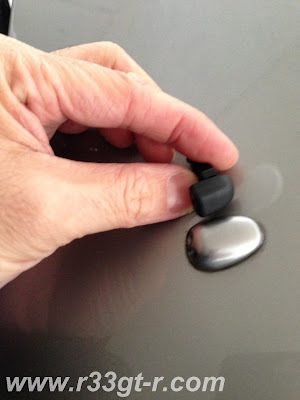 However, unless I actually have a need to use the vents to cool the rear brakes, I was told it was better off capping off the scoops – because any time air is channeled somewhere, drag is created. So first I will have to determine whether rear brake cooling is even needed (Andrew believes probably not), so I will have to experiment with this. 5. As mentioned earlier, there is lots of air that gets trapped in the engine bay with no way out except down. 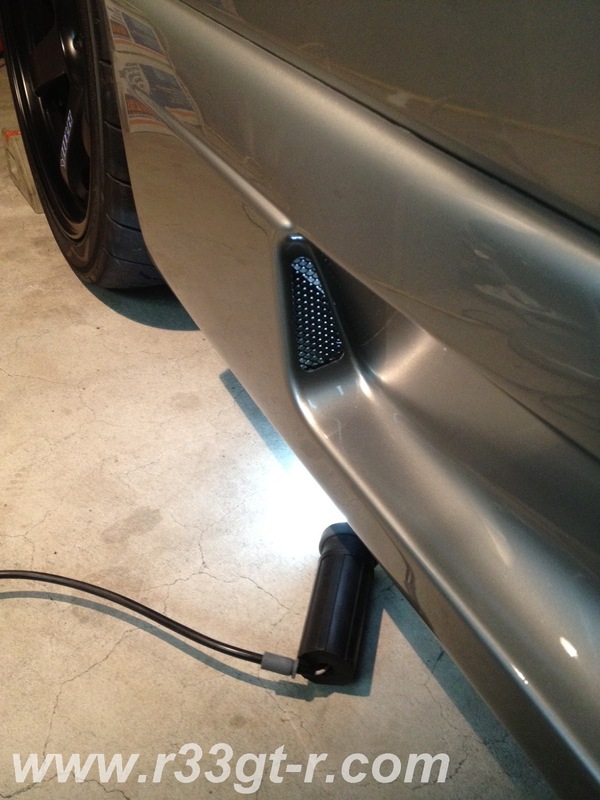 Whatever work the front and rear diffusers would do thus gets disrupted. So I first need to figure out how much air is actually needed, then begin sealing up areas which lead to the air getting trapped, and guide the rest of the air to the cooling bits - the intercooler and the radiator. This would mean removal of my front bumper, and then finding various places to seal off. Of course, the easiest solution is to install a vented bonnet, but of course that takes away from the OEM look of my car, hence I am resisting. 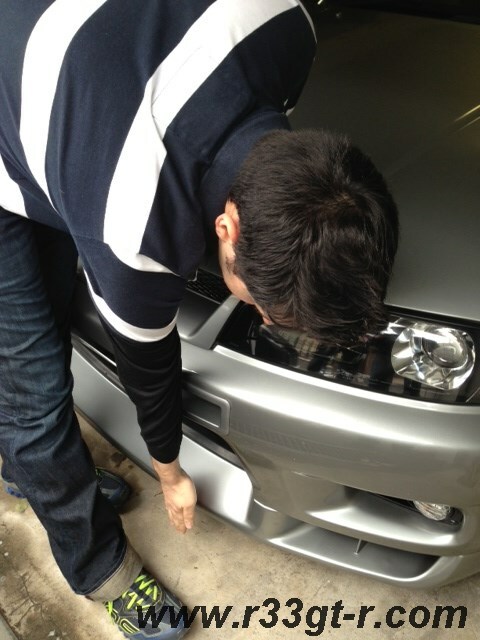 Andrew pointing out some of the spaces where air can enter and get trapped in the engine bay. 6. Front bonnet lip. 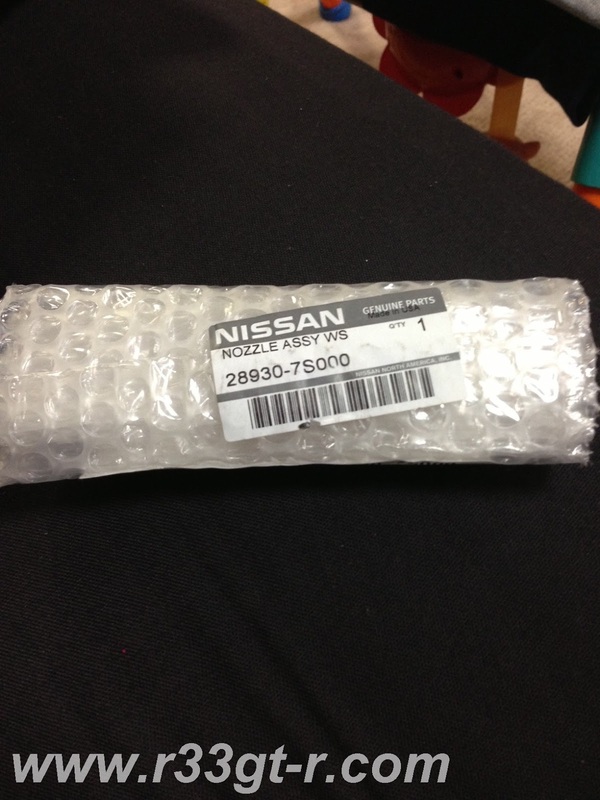 I actually have one, but have yet to install it (the idea of drilling holes in my stock bonnet…arggh). This should work to improve the flow of air under the bonnet, but again, whether this is something to be done (see above) is questionable at this point. As long time readers know, I used to have this on my car, but took it off in favor of the current three piece from Silk Road. I had always wondered about the theory behind that, as it seems counter to everything out there on aerodynamics. Andrew believes that the hump in the middle is designed to collect a bubble of air which generates drag, but also causes a pitching movement which then helps push down on the front wheels and lift the rear which probably has more than enough downforce to begin with. 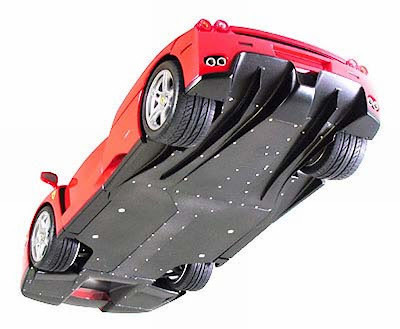 Makes sense, but apparently this was popular in the late 90s/early 2000s in Super GT, however there are now more efficient ways to generate even more front downforce. So it turns out I’m lucky enough to live literally down the street, here in Yokohama, from fellow American and Cal graduate Andrew Brilliant, who is an up-and-coming racing car aerodynamicist /engineer. His work includes the Under Suzuki S15 (record lap setter at Tsukuba) and the NEMO Evo (record holder at WTAC), both featured recently on Speedhunters as well as other interviews. 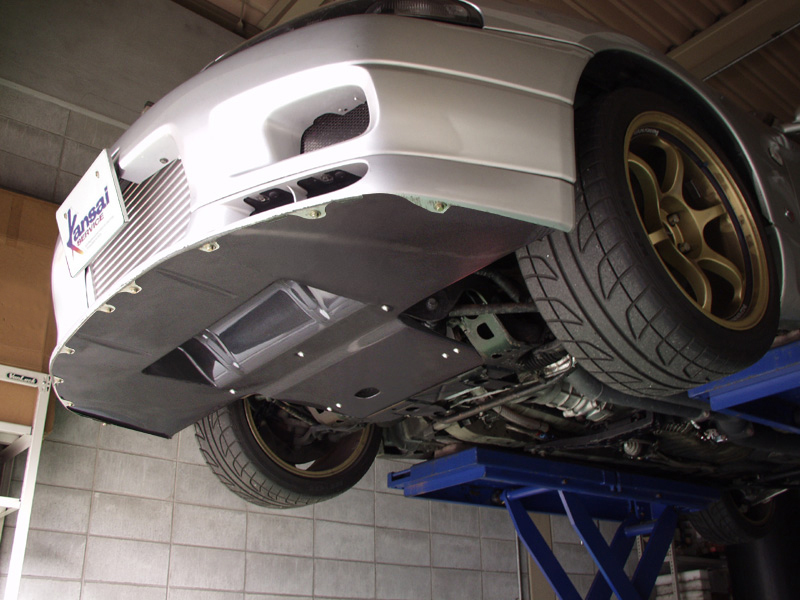 Back in the US, he also became well known for his work on his own Mitsubishi Eclipse which he modified using aero techniques, which helped it become one of the fastest tuned FWD cars out there. Anyway, it’s clear the guy is a gearhead who not only knows, understands and applies aerodynamic theory and techniques not only to his own car (making it one of the fastest and most aerodynamic Eclipse race cars ever), but someone who is expert enough to be successfully make a living in this area, various racing cars to his credit (making them so good aerodynamically that he’s had the rules changed on him… on more than one occasion). So this past Sunday, Andrew was kind enough to drop by my garage for a couple of hours and give me not only a quick education on aerodynamics, but also point out the good and bad of the R33’s aerodynamics, and give me some ideas on how I can improve my own car’s aerodynamics. Of course, some of his ideas are a bit too extreme, more applicable for race cars than for road cars, so the extent to which I will be able to modify my car, if any, will be limited. Nevertheless, worth trying I think! First, we discussed the basics – drag, coefficient of drag (“Cd”), lift, downforce, and frontal area. There is generally a misconception as to what constitutes good aerodynamics on a car. For example, manufacturers chase low Cd numbers, and while this may be important in a mass market car where improved fuel economy is the goal, on a racing car, while drag numbers are important, downforce (or negative lift) is just as, if not more, important. Having sufficient downforce means the car’s tires stick to the ground better, resulting in better acceleration, handling and braking. More downforce on the front end of the car only, for example, will reduce oversteer. The other way to get more traction would be by increased vehicle weight, which then requires more engine power, reduces gas mileage, etc. 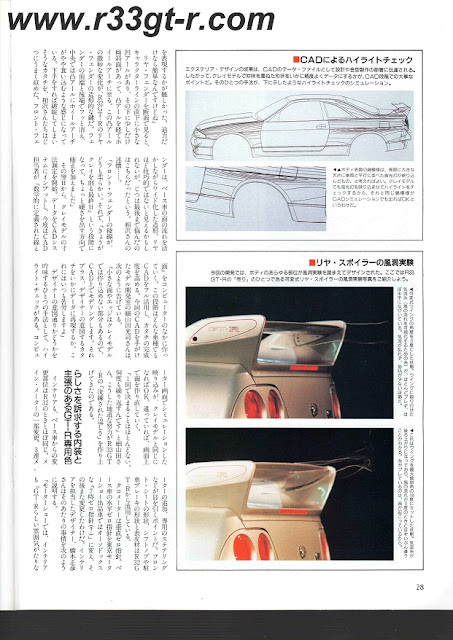 So aerodynamically generated downforce is definitely the way to go, as this article explains. 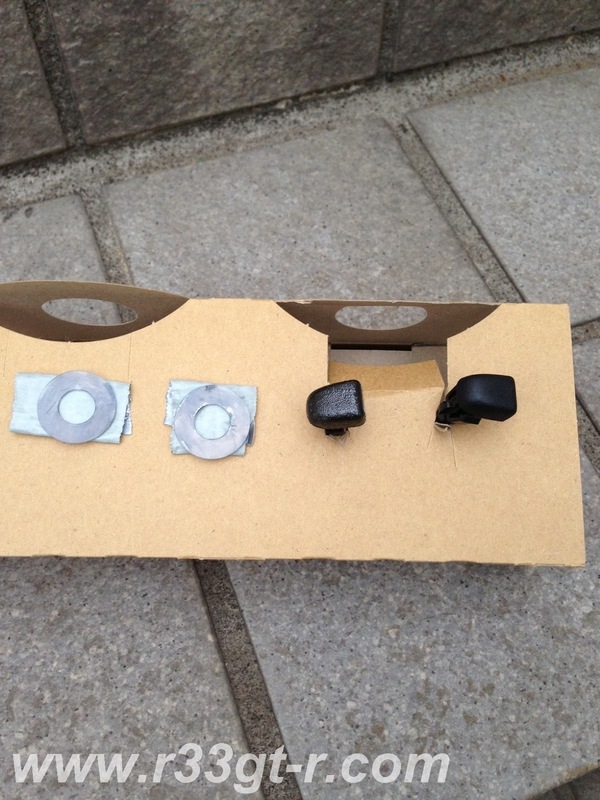 Unfortunately, the usual downforce devices also generate drag, so a balance must be struck. Speaking of drag, it turns out that the Cd is not the only drag number at play – the frontal area of the car is also important. 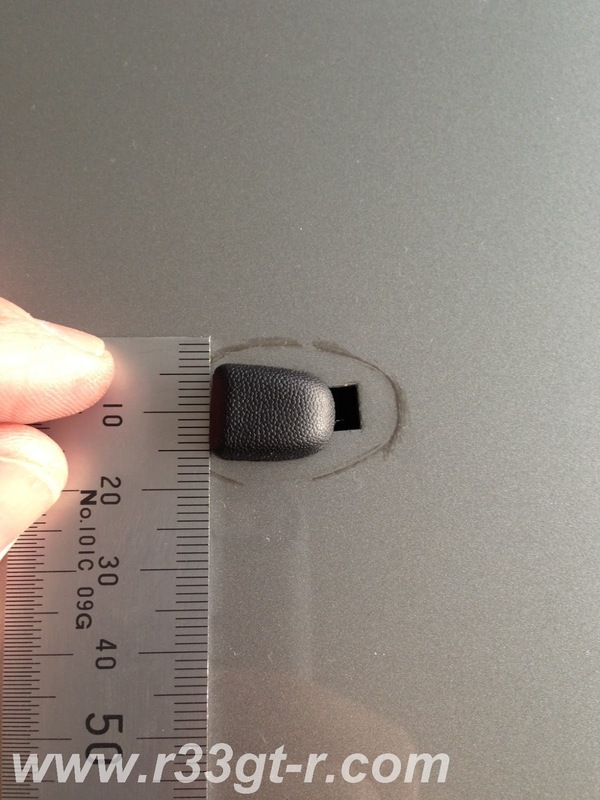 Both numbers should be minimized in order to reduce the total amount of drag on a car. 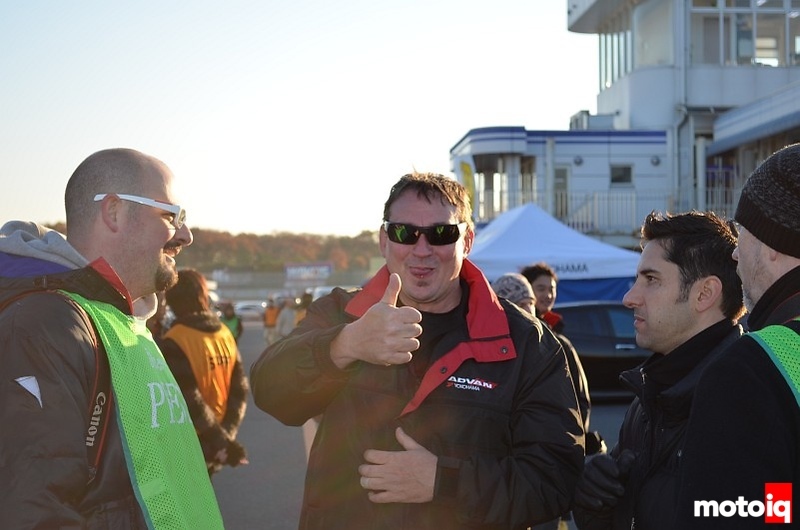 The best car Andrew’s seen in terms of total drag force is the Honda NSX – small frontal area and low Cd number. Unfortunately, the frontal area cannot easily be changed without basically redesigning the whole car, obviously. So with respect to my car, my emphasis will be on improving downforce. Spoilers - what is on the rear of my car is a “wing” and not a “spoiler.” This may sound obvious but many people mix this up. And, it turns out that the term “spoiler” came from the concept of a “lift spoiler” – in other words, the device was originally designed to eliminate lift on a vehicle or wing, where you might normally have lift. 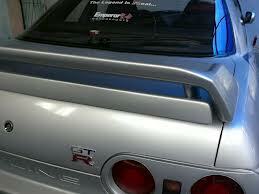 This R32 GT-R has BOTH a spoiler (lower) and wing (upper). Wing - A wing on the other hand is more efficient than a spoiler – it’s basically the most efficient aerodynamic shape. A string, for example, 1/10th the size of the wing, has MORE drag than that spoiler, so when people use wire to support various parts on a car, they are actually creating more drag… Wings and spoilers, however, are usually found on the rear of cars, and so this is only really good for generating downforce on the rear of the car. Canards - According to Andrew, he would have to see what’s out there for the R33, but most of the designs he sees appear to be copies of Super GT stuff. However, canards are all are very design specific – i.e. every bumper is different, and so there is no such thing as a “universal” canard. There are explanations out there as to whether carnards are down force producers or vortex generators, but either way, their use is controversial. 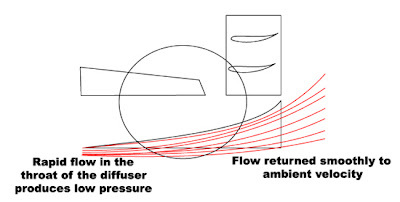 Diffusers - A diffuser is basically an expander – it takes a flow of air and expands it to a larger volume of air. 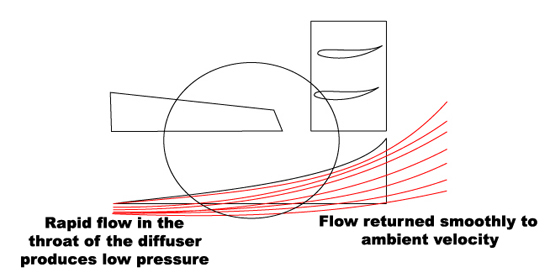 This works due to simple physics (conservation of area – increase the velocity, trade off somewhere else) - because you have ambient air pressure behind the car, higher air pressure in front of the car, and then the air, flowing from a larger front area to the rear via a constricted area (the diffuser), the air will have to travel faster in the constricted area, thus reducing the air pressure! This reduced air pressure creates negative lift, or downforce. What about the R34 rear diffuser? Andrew opined that its benefit is mostly to reduce drag and maybe produce some downforce, and of course there is the nice side effect in noise reduction. This makes sense to me, as anyone can see that air passing under the car would otherwise get caught against the bumper. Side Skirts: the primary purpose of these is to create a low pressure area under the car, mainly by directing the flow of air to the rear diffuser, if any, as well as to prevent ambient (and thus higher pressure) air from interfering with the air under the car (which should ideally be lower pressure). 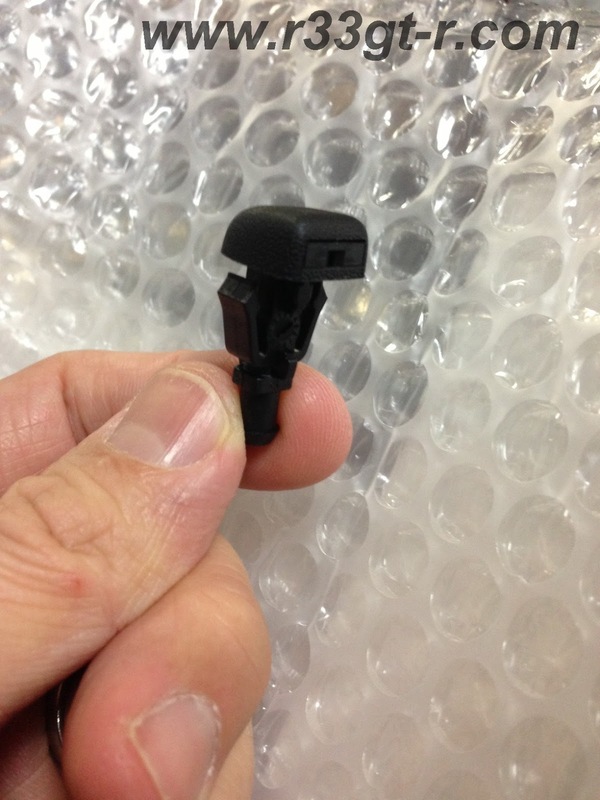 Another Modern Upgrade - "Fluidic" Windshield Washer Nozzles! on par for what was normal in the late 1990s. However, it turns out that a US company, Bowles Fluidics Corporation, had developed a new line of “fluidic” nozzles –which due to their different design, are able to more effectively and efficiently apply washer fluid to the windshield (less spray, more coverage, etc.) – and thus rapidly became the OEM choice. Compared to the traditional single or double stream nozzles, these fluidic nozzles generate a wide, disbursed spray, covering more area with less fluid and hence reducing waste. Here is video to compare the two types. Well, while I search for fluidic nozzles that are larger, I decided to get creative with what I have. These fit perfectly! 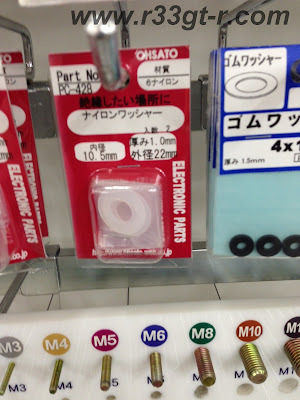 However, even when installed, things were a bit loose, so I decided to use 0.5mm rubber, cut to shape and size, below the nylon washer as "fill." (and it means the washer won't move, either!). Also, there is something that CLAIMS to be similar, but it is not. this uses a different technology, yet is much more expensive than my $3 pieces…so for now, I am mildly satisfied... 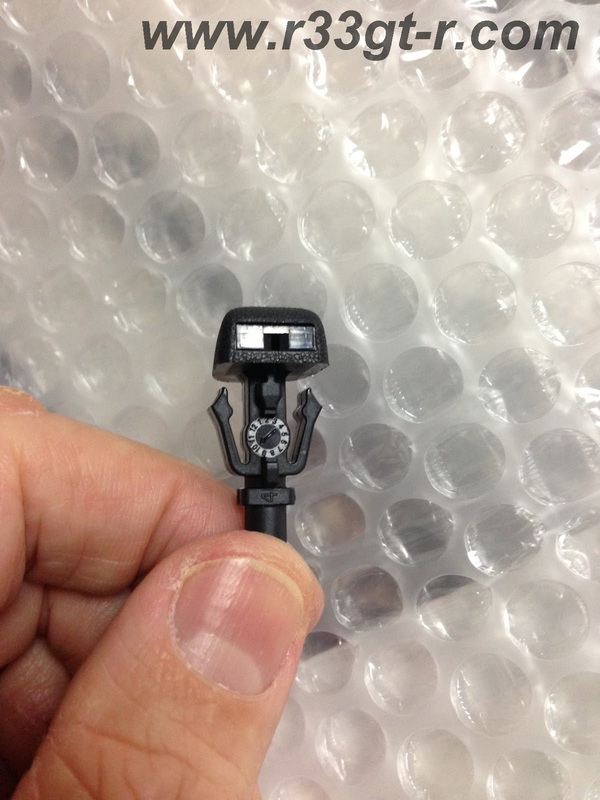 I'll be 100% happy if I can find a fluidic nozzle that fits the OEM hole perfectly... If anyone out there knows, please leave a comment and tell me! !